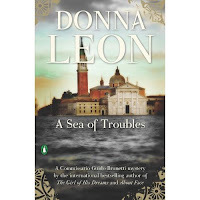 I've been reading Donna Leon's A Sea of Troubles, which was published in 2001 in England but has not, as far as I can tell, been available in the U.S. until a new Penguin edition appeared this year. But while reading, I kept thinking I'd read it before, or perhaps heard it as an audiobook. Then I realized that I had had the peculiar experience of seeing it, in an episode of the German TV series, Commissario Brunetti, with the title Das Gesetz der Lagune (meaning something like The Law of the Lagoon) that had been broadcast in the U.S. a few years ago by MhZ Networks. I found the episode on YouTube and watched it again, though without subtitles this time (and I don't speak German). It's a peculiar experience watching a story written in English and set in Italy now presented in German, with only the occasional Italian word interrupting the flow of German coming from the mouths of Brunetti, Signorina Elettra, Vianello, Patta, Brunetti's family, and the fisherman on Pellestrina in Venice's lagoon. Leon's novel includes an uncharacteristic aspect of the thriller, with the police, a villain, Elettra, and her boyfriend all battling a sudden storm in small boats in the lagoon, plus the sudden murder of one of Brunetti's men and an act of violence on Brunetti's part (plus for once some partial justice for the crimes committed). In the film, I suppose the filmmakers were unable to conjure up a sudden storm and so the drama is a bit more conventional--the thrust of a knife, a gunshot... But still set on Pellestrina and a nearby ruin of a fort. In both film and book, Elettra is more of a focus than usual, and Patta a bit less, but the frustrations of investigation are typical of Leon's novels, in this case primarily caused by the refusal of anyone in the fishing village to say anything to the police. Some of the characters in the novel are combined in the film, resulting in the witless Alvise going undercover as a waiter rather than the more resourceful Pucetti (though in both cases the ruse is fruitless). Leon's novel is a vivid portrait of Venice, Pellestrina, and the lagoon and the narrative shifts suddenly into overdrive in the storm--but as usual the plot is secondary to character and to the frustrations of Italian law and society. The film is quite effective in portraying Venice, with the resources of the moving image, and does a pretty good job with the characters--the actors mostly look enough like my mental image of them that there's no cognitive dissonance, once you accept or get used to or forget the language dissonance, for an English speaker or anyone who has been in Venice and heard the Italian or Veneziano spoken there. I'm pasting in a couple of images from the series, of Brunetti withh Vianello and Elettra and one of the Brunetti family (whose patio has been moved from the Polo area to the Grand Canal, apparently). 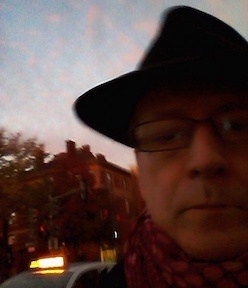 If anyone has any reaction to their appearance, in relation to the mental image of the characters imprinted on the mind by Leon's prose, leave a comment so we can share. Oops I thought of Brunetti as a bit older and far less hairy. Paola looked fine, but Elettra looked too young I always imagined her as a cool blonde. A Sea of Troubles was not one of my favourites but I have wondered why no one has set up a cable station to provide these European series with subtitles to the UK. Brunetti older, taller; Vianello a bit older, bigger; Paola a bit older, thought she had reddish hair; and Elettra older, very suave and sophisticated, dressed very fashionably.